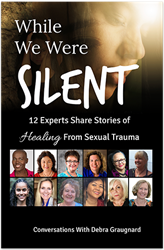 Joyfully Living Wellness is excited to release the new book, "While We Were Silent: 12 Experts Share Stories of Healing from Sexual Trauma," a series of ground-breaking interviews to support healing for victims of sexual trauma in the wake of the #MeToo movement. While We Were Silent is a wealth of wisdom, resources and diverse options to serve survivors at different stages of recovery. The book broadens our understanding of how survivors can overcome biological nervous system responses to trauma, release internalized shame and grieve the losses of abuse. The #MeToo movement is far from over. Many lives have been stirred as old wounds are opened and buried traumas are resurfacing – not just for those who attract media attention, but for victims of sexual trauma everywhere. These people need resources for healing. Still others are questioning why someone would stay silent for so long after experiencing abuse. Could there be ulterior motives? A conspiracy? The 1 in 4 women and 1 in 6 men who experience sexual trauma will tell you: Silence is the norm, not the exception. "While We Were Silent: 12 Experts Share Stories of Healing from Sexual Trauma" is a series of ground-breaking interviews cultivating open conversations in a safe, respectful, skillfully-facilitated environment. The interviews are conducted by Debra Graugnard of Joyfully Living Wellness, who brings heart-felt passion to this project to help those who have experienced sexual trauma find resources for healing and those who have not to understand the struggles of the journey. Why people stay silent after abuse. What happens during the silence. What is possible with personal healing. How individual healing can help bring about change in the culture and our world. What possibilities await as our culture shifts from one that has allowed the prevalence of sexual abuse to one that fosters mutual respect and harmony. Each author shares the breakthroughs, turning points, therapies and healing modalities they used to heal their bodies, minds, hearts and souls, and how they use their experiences and expertise to help others. They share essentials for understanding trauma that are key to self-understanding, self-compassion and self-acceptance – and fundamental to a trauma survivor’s healing journey.